I’m beginning to fall in love with Spider-Man again. This comic was far better than it’s predecessors, even better than the other heroes, especially the Human Torch, who is also a teen hero but I’m starting to get bored of his antics. Peter Parker is refreshing for me, he’s funny, witty, smart but still is realistic in that he makes dumb and arrogant decisions just like an ordinary teenager. This comic is a two-parter with Peter in two very difficult binds. 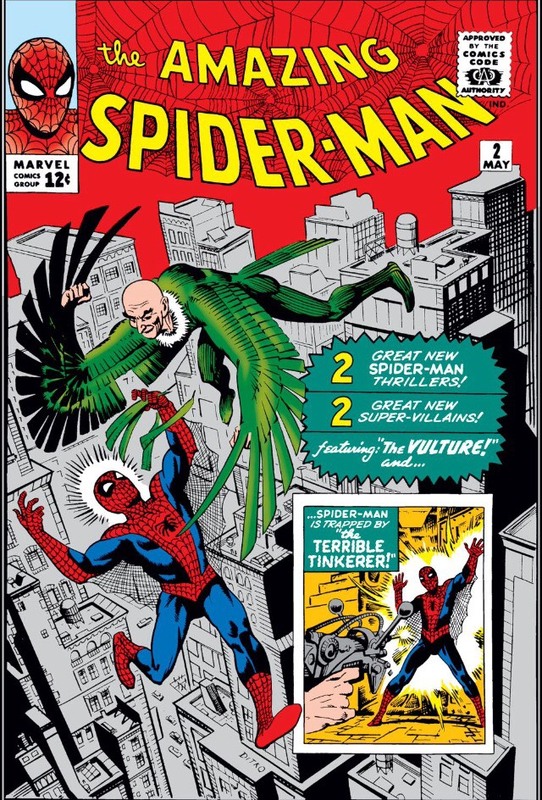 In the first part, he is up against a villain called the Vulture, who actually looks just like a vulture, but who steals from others but is also very smart with his schemes. He rids himself of Spider-Man often, and in a scheme where he steals high priced jewelry he is smart enough to come from underground because he knows the police would be watching the skies for him. This is also the comic where Peter decides to go and work for the newspaper as a photographer. The newspaper is fervently looking for photographs of the Vulture but no one is fast enough or can get close enough so Peter takes it upon himself to do it and in turn make some extra money to support Aunt May and himself. I like this theme which has been following through the Spider-Man comics, that because of Uncle Ben’s death, Aunt May being elderly and Peter being a teenager they are strapped for money, it’s extremely realistic especially for the age, and I’m glad that it is followed through (it is even explored in the crossover with the Fantastic Four where Peter asks them for a job. Had to add this pic because it looked Peter was diving in a vadge. 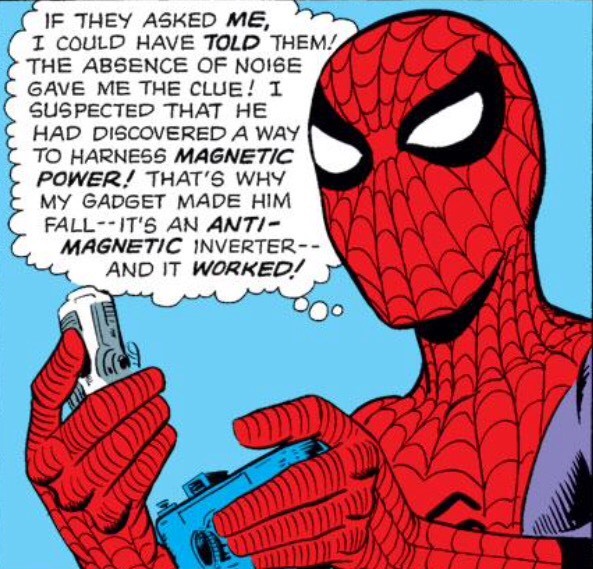 It’s also interesting to note how smart Peter is, but he isn’t portrayed as a genius like Reed Richards, simply as a clever kid with a head for science. I love the fact that even though he is bullied at school he still isn’t ashamed or shy about his knowledge, he always has a comeback or brushes off what his peers say. He is proud of his smarts. 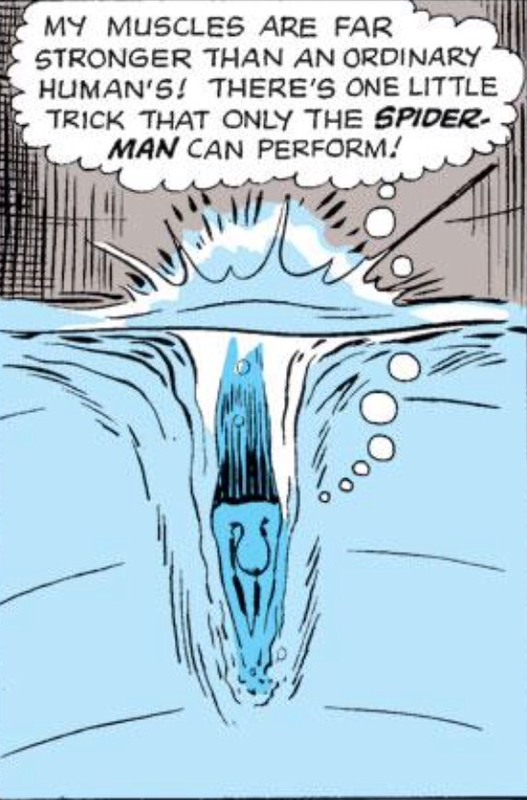 The second half of the comic was a little less exciting than the first and seemed like a rush plot where a lot wasn’t explained, it seemed more like a quick cartoon than a comic. Basically Peter is chosen to assist some successful scientist/engineer because he is the best student in his class, Peter goes to fetch a radio that his boss had repaired and the place has a weird energy about it, Peter is suspicious, he goes back to check out what’s going on and discovers aliens building spy energy into the radios, he defeats them and then returns to work. 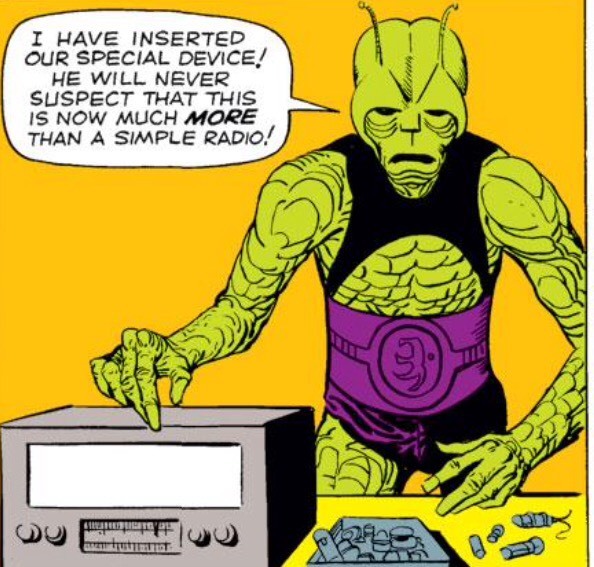 It is never revealed why radios, what the aliens plans are or anything concrete, it’s just a massive WTF the entire time? I don’t blame Peter’s boss for thinking nothing was amiss, the dude fixed radios, there was no weaponry in the radios just spy equipment. It was all very confusing. 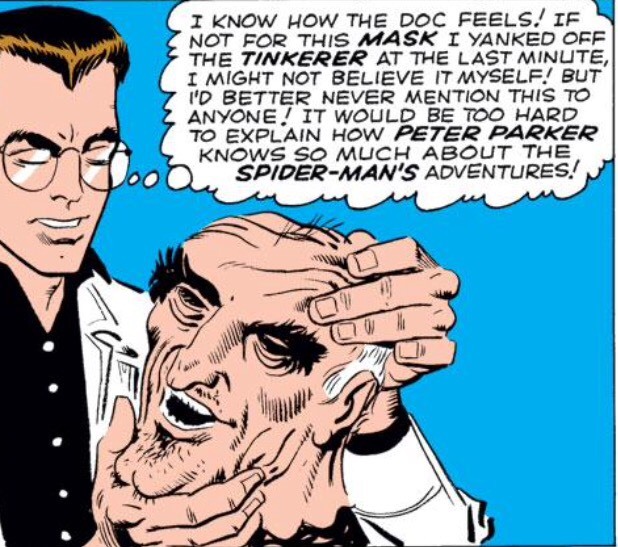 But the one creepy part was that they didn’t reveal that the radio repairman, the Tinkler, was an alien too until the very end when after the boss leaves Peter’s lab, Peter just pulls out the Tinkler’s face because apparently it was a mask all along. Creepy. Also P.S. I was just want to note that Peter does not look like a teenager, he looks 40 years old minimum.